THE CANADIAN PRESS — CARACAS, Venezuela - President Hugo Chavez made a surprise return to Venezuela from Cuba before dawn Monday, saying he is feeling better as he recovers from surgery that removed a cancerous tumour. State television showed a video of Chavez arriving about 2 a.m. local time. The footage was aired a little more than five hours later. "I'm fine. I'm happy," he said after stepping down from the plane and hugging his vice-president, Elias Jaua, and his elder brother, Adan. "A perfect landing." 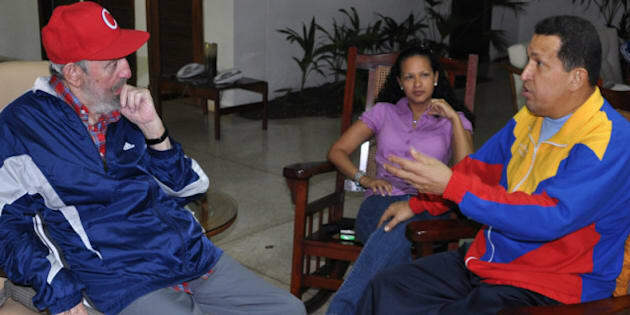 Later, in a telephone interview, Chavez told state television he was having breakfast. "I'm devouring everything," he said. Chavez said he spent "very difficult days" in Cuba but that his recovery is going well. President Raul Castro saw him off on the tarmac as he departed during the night from Havana. From the door of the airplane, Chavez saluted, raised a fist, and then waved and blew a kiss. He arrived a day before the 200th anniversary of Venezuela's declaration of independence from Spain. A military parade and other events are planned to mark the bicentennial. The 56-year-old president had arrived in Cuba on June 8 for what ostensibly was a previously scheduled visit. Chavez has said he underwent an initial surgery on June 11 to have a pelvic abscess removed and then a follow-up surgery to remove a cancerous "abscessed tumour" from his pelvic region. He announced the second surgery Thursday after an 18-day silence. Neither he nor government officials have given details about what kind of cancer it is nor what treatment he is receiving. Jaua said he and others were "very excited to receive our president." Chavez's military chiefs stood behind the president as he spoke on the tarmac, the plane's engine still running. He wore a blue-and-white warm-up suit as he stepped off the plane in the darkness. He appeared thinner than usual but energetic. "He's going to rest for a while," Jaua said. Chavez invited his supporters to attend a rally later Monday, and Jaua said the president had plans to address his supporters from the balcony of the presidential palace. Former Cuban President Fidel Castro, meanwhile, ended a more than monthlong silence to laud Chavez's recovery from surgery in Cuba, saying he was confident the Venezuelan leader will win his battle against cancer. In an essay published late Sunday, Castro said his country has a "close and indestructible friendship" with Chavez. "Let's give him the strongest support and confidence," he wrote. Castro said Chavez has worked almost without stopping since taking office in 1999, so it was only natural that his health would suffer. But he said the Venezuelan leader was recovering well. "Without hesitation I affirm that the results are impressive, and I do not hesitate to affirm that the patient has undertaken a decisive battle that will lead him, and with him Venezuela, to a great victory," Castro wrote in the essay, posted on state-run web portal Cubadebate. Castro also backed up Chavez's account that he did not initially come to Cuba for treatment. "Some have found strange the coincidence of his visit to Cuba with the need for the medical attention that was carried out," Castro wrote. "The Venezuelan president ... did not have any intention of receiving medical services in our country." Castro's essay was accompanied by photos of him meeting with Chavez. The site said they were taken earlier in the day. Fidel Castro wasn't visible on the tarmac in the video of Chavez boarding the plane in Havana. But Chavez joked that "Fidel practically got on the plane."